Sikkim, in the north-eastern region of India, is heaven in April. I remember how, after my wedding, we took to the hills of Gangtok and Pelling. The flowers were in abundance; it was springtime. Orchids, fuchsias and beautiful roses grew in the wild and it was hard to put a price on such abundance there, what with the same sold for a fortune in a city like Bombay. I made this watercolour painting on canvas, of all things. Yes, a framed and primed canvas – the kind that you find in hobby and craft stores. 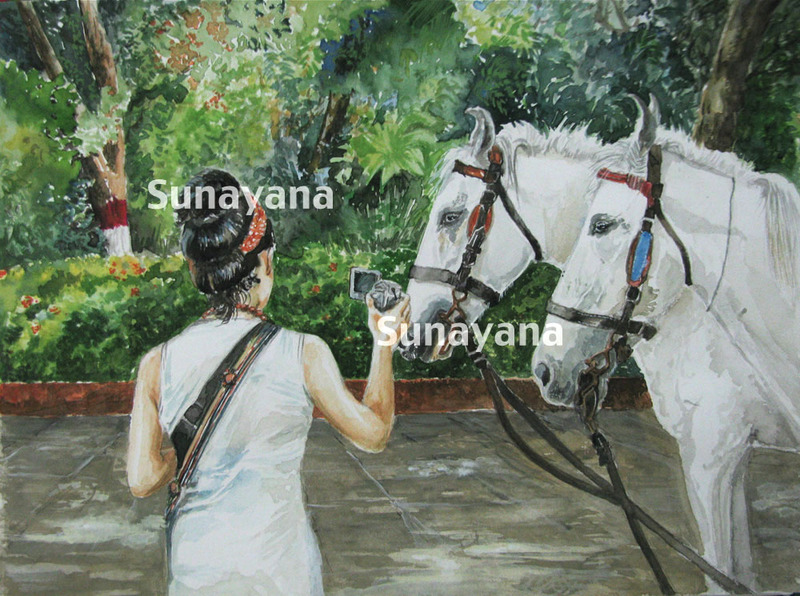 Most people express their surprise at the fact that I used watercolours on canvas instead of on paper, but it wasn’t difficult at all, perhaps because it was a well-treated and primed canvas. The painting has no damage marks yet (it’s been 3 years) so I guess it’s not such a bad idea to use watercolours on canvas. 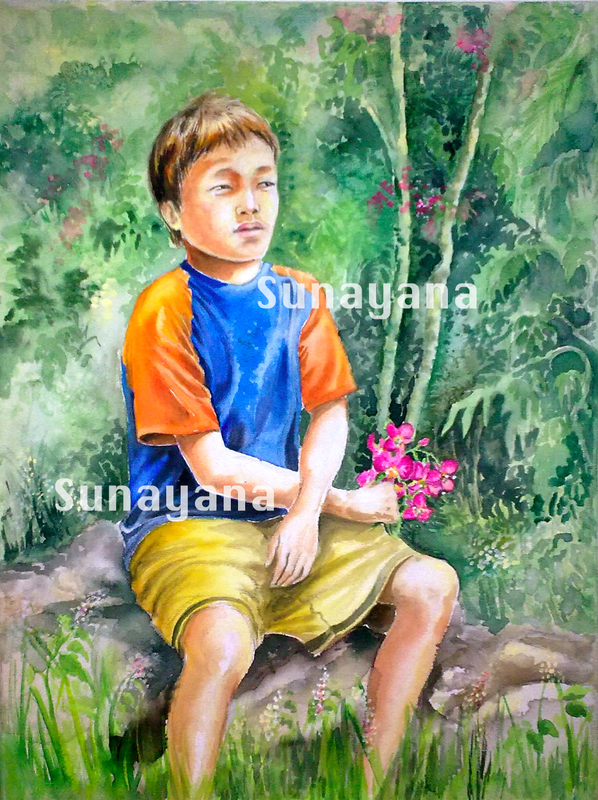 So I painted this one from a photo taken in Sikkim, where a little boy sat down to rest after climbing trees to pluck a few orchids. As I clicked his photo from our vehicle, he became a tad conscious and tried to hide his orchids, perhaps for no good reason than to hide one’s recently coveted prized possession. I dedicate this painting to the hard-working hill people of Sikkim, their beautiful babies, furry dogs and abundant natural wealth. For a while now, I’ve wanted to become a children’s book illustrator. A child’s world is boundless. As we grow into adults, our imagination is bound by the outside world – the real world. It’s sad how, as adults, we shrink our thoughts down to facts, numbers, quantified details and the mundane. It’s sad to be in the real world sometimes. Pay attention to what children say, and, although at first you may fail to fathom logic in their stories, you realise that they are far more creative and imaginative than adults. They perceive things through their true form, backed by their vivid imagination and memory, not through some projected image that is learnt by experience and teaching in a rigorous school of thought and training. When they write, they write without inhibition, when they paint, they paint from the heart. Later, as they grow up, they stop being their natural selves on account of some external conditioning. Social conditioning is such. It kills the self and trains us to become the clone of an ideal. 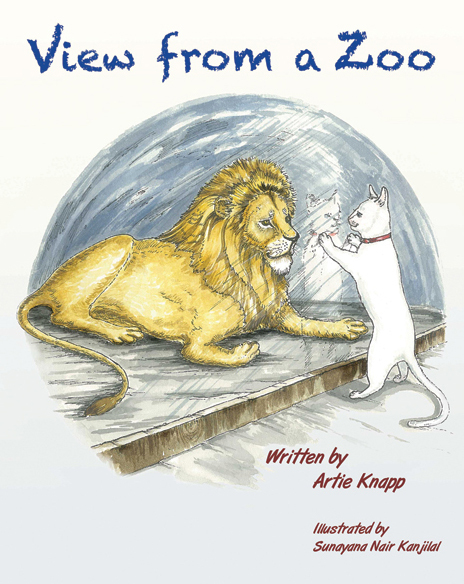 Fortunately, for an adult like me, who is constantly amused by adult social interactions and opinionated conversations, I sometimes find my recourse in children’s books. I will never get back the experiences I’ve had as a child, but at least I can recreate my childhood by indulging in a bit of fantasy through art. The initial mulling over this illustration brought me some random images – a big red mushroom (I’ve always been fascinated with giant mushrooms), an ant taking shelter from the rain, and some foliage. A lot of Alice in Wonderland images floated about in my head. They were impressions from all the illustrated children’s books I grew up on. I didn’t know what else could come into the picture. The draft illustration was initially done on my phone. In the final version, I let the ant remain, but changed it’s posture and apparel. Then, I thought of doing away with the rain. The illustration was still in it’s nascent stages, when I was sort of thinking aloud in front of my husband, and suddenly exclaimed, “The ant plays a violin!”. So that was it. 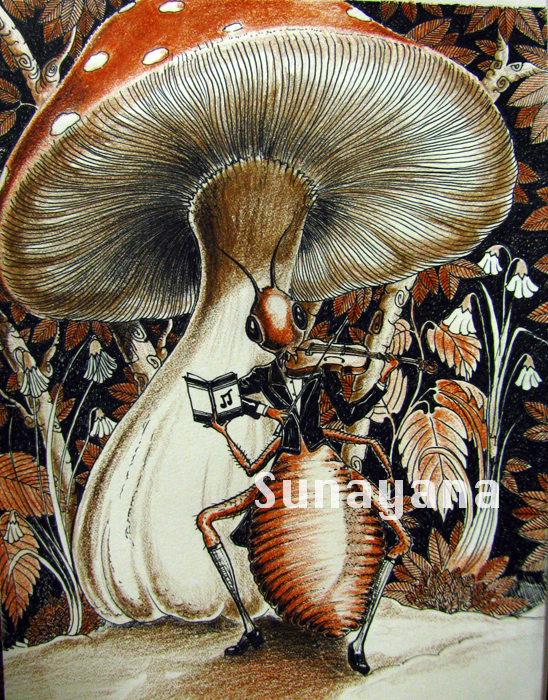 The ant had to play a violin under a huge red mushroom, never mind if it didn’t make sense. Bah! As though stuff like ‘The World Wars’ made any sense ever in the adult world! My husband aptly titled the sketch ‘Antiolinist’. So I had two of the ant’s spindly legs holding the violin and the fiddle stick. Another leg (arm for that matter) holds the music sheet. The ant is well-dressed, although a little wanting in cover on the lower torso. It stands poised on two strong feet, replete with shiny boots and pulled-up socks. The eyes are large and deep. I did the illustration with a pencil, darkened it with a microtip pen and then coloured it over with rust and brown coloured pencils. Some say the illustration tells a story. What do you feel? Perspectives are what all of us have. What sets you apart from me is how your perspectives are defined in life. The word ‘perspective’, a derivative of the Latin term ‘perspicere‘ or ‘to look through‘, aptly defines a vantage point or view that is specific to the observer’s eye. It cannot be replicated by someone else, unless the person stands where you do. Perspectives also have a way of confounding you. For instance, if you happen to travel the length and breadth of India, a myriad perspectives form on the journey, not just visual but also cultural, structural, societal and regional ones. Why else would India be called a ‘melting pot’? In April 2012, we had planned an escapade to beat the sultriness of Mumbai. Rain was not anticipated soon and like every Mumbaikar, one dreaded the yawning gap between April and June – June being the month that brings in the soothing monsoon. A trip to Dharamasala materialized well. As we climbed to cooler heights in our bus from Delhi, we felt we were transported to the heavenly abode of the Gods. Dharamsala lay silent in the idyllic hills of Himachal Pradesh, fortified by the great Dhauladhar range. This is the place where His Holiness the Dalai Lama had settled and spread the word about Peace and Buddhism, two catchwords that can never be separated. Along with the apple-cheeked, ruddy hill people of Himachal Pradesh, you also see an equal number of Tibetans here – those that escaped Tibet following the Chinese offensive, to settle in and around Himachal Pradesh. I refrain from saying that Dharamsala is ‘occupied’ by Tibetan refugees. That’s a harsh term with many political leanings and no worthy meaning. My perspective allows me to safely say that when Tibet was troubled by the oppressive Chinese, it’s people didn’t have an option but to flee across their border, although some stayed back only to meet their tragic end. The shivers are still felt and seen. Even as we enjoyed our trip in the hills, we came across a peace march for yet another incident of self-immolation in Tibet. As early as 1959, India had offered refuge to the Dalai Lama and his fellow Tibetans. It was probably the ethical thing to do at the time. We let them stay. Who are we to define imaginary borders? They are as unreal as a mirage in the desert and as juvenile as hopscotch. Borders only breed feelings of alienation and contempt, and keep the border security forces busy. More than 50 years after the exodus, Tibetans in India still pray and hope for peace in their native land. Dharamsala was once a sojourn for these refugees, but now it is home to them. They have established numerous trades and businesses, lending a different flavor to our culture in the forms of Tibetan art, music, food, and language. Monotony of any kind does not help the creative soul, the wanderer and artist, so I’m glad we have assimilated such diverse cultures. 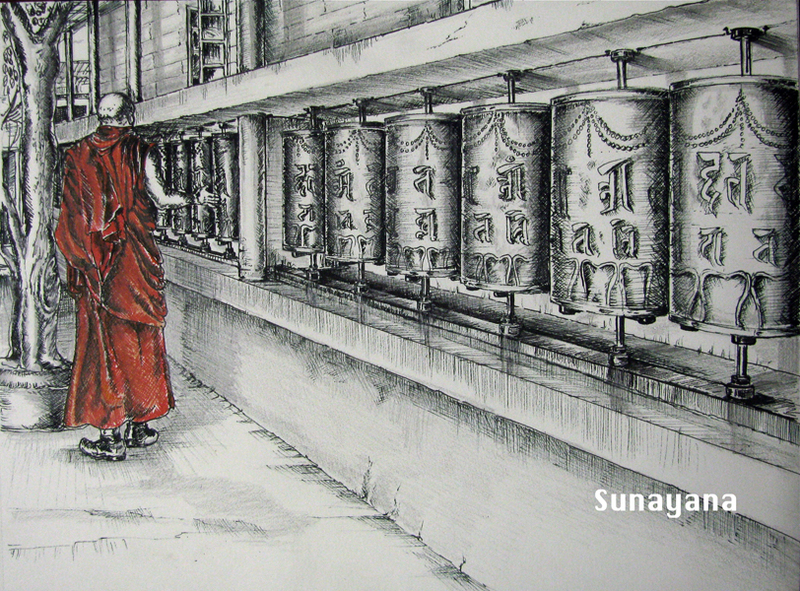 I have a sketch from the Dalai Lama’s temple in McLeod Ganj. One side of the squarish structure is flanked by an obscure gate at a busy market street, and the other side overlooks the valley and pine trees below. If it is true that places of worship give out positive vibes, then it is truest for this temple. We circled around the inner sanctum, set in yet another square, enclosed by cylindrical prayer wheels on four sides. Turning the wheels in a clockwise direction is said to give out positive energy. The inscription on them read ‘Om Mani Padme Hum’, a six-syllabled mantra that holds the essence of Buddhism. The mantra reverberated in my heart long after returning to the city. It has an amazing calming effect on the mind. 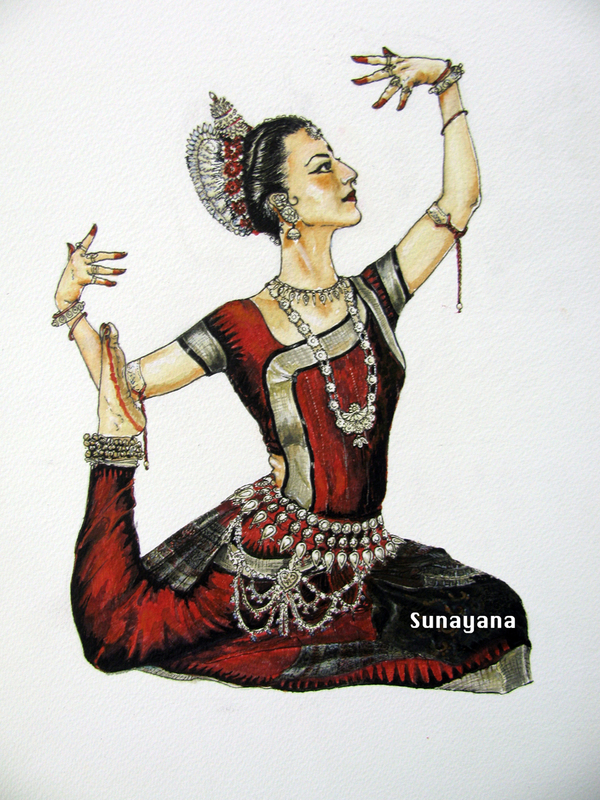 The sketch was obviously made from a photo after I returned to Mumbai, because I rarely sketch on the scene. Live sketching is something I need to develop; it is the mark of a good artist. But thank goodness for digital photography, for I would have lost many an opportune moment! The perspective in this sketch was challenging, especially because I had to draw the wheels according to their graduated height and width, but the results were satisfying. The whole sketch was first drawn with a pencil, and then darkened with a black microtip pen. I love those pens and their oozing wet ink. I coloured the monk red with a microtip pen too, so as to define the subject in the picture.